Move Over Rio – The Barcelona Carnival is Where You Want to Be! Barcelona is a fantastic destination for a weekend break or a longer holiday. With the blend of culture, coast and countryside the cosmopolitan Catalan city is vibrant, colourful, exciting and diverse. Barcelona is a destination suitable for all the family. This diversity and cacophony of sound and colour is a reason why this is such a fantastic party city. The people of Barcelona love to celebrate their culture. There are a variety of festivals, carnivals and fairs. There are around thirteen major festivals and carnivals in Barcelona throughout the year as well as smaller neighbourhood parties. There is no better time than fiesta time, to really embrace and gain an understanding of the lifestyle in Barcelona. Originally banned by Franco until the year 1980, this carnival is the last chance to let your hair down before Lent, taking place during February and March. The La Gran Rua de Carneval is where the carnival comes together and a sea and spectacle of floats, fireworks and fancy dress are in abundance. Some of these festivals are around religious holidays, the biggest beingSant Joan. This celebration is marked with thousands of fireworks, pyrotechnics, all washed down with sangria. The eve of Sant Joan is the biggest party night of Barcelona’s calendar. The day that follows is a public holiday and therefore this is a fantastic chance for the people of Barcelona to really let their hair down. If you are still celebrating at sunrise then head to the beach to watch the sun come up. In autumn, in the 24th September, this festival is celebrated by one of the biggest street parties in Europe. This festival sees the re-enactment of many Catalan traditions. There is a programme of concerts across thecity and these events take place either side of the 24th. There is also free entry to museums on the day. One of the lesser known celebrations during the last two weeks of August, during the week and weekends, the residents of Sants host a street party for one another. As you wander through the highly decorated streets, you can marvel at the efforts made by Sants residents. Take the chance to sample some ‘botifarra’ sausage or ‘fideuà’ noodle-based dish, or any of the delicious offerings. Dancing and drinking a large parts of this festival, particularly the spicy rum ‘cremat’ which is set alight, with music filing the streets of this corner of Barcelona you can enjoy classical music as well as a variety of other live music shows. Barcelona is home to city, coast, mountains and beach, it really can offer a fantastic all round experience. 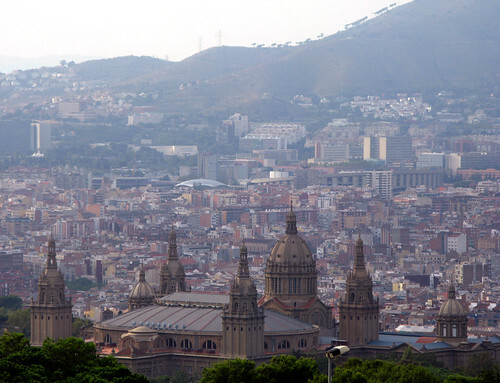 During July, there is a free festival on the Montjuic mountain, with its’ idyllic views across Barcelona. During the evening there is a melee of film festivals, one minute film festivals, open air concerts in the Grecian amphitheaters. This is one of the most infrequent festivals, but it really is worth keeping a watch for details of when and if this festival is on. available but packing a picnic yourself can be a wondrous treat. This race fills the race calendar in May and has been regarded as a festival for its popularity and draw to the region. The race comes into town and is a hive of activity, a draw of celebrity and a melody of engine noise,happy crowds and celebration. The Circuit de Catalunya is based twenty kilometers outside Barcelona inMontmelo.It is a popular event and can be one of the more affordable raceson the racing calendar.The three day event, entices crowds to buy into the story of the season, supporting the teams colours their favourite driver. You don’t necessarily need to know a lot about F1 to enjoy the spectacle of pit crew, paddock, fast cars. There is a natural competition and part atmosphere surrounding these events and therefore this race weekend is a wonderful excuse in itself, or a way to start a week or end a week in Barcelona. So next time you are taking a trip, consider booking it around the festivals, perfect for a group trip. Festivals can attract more people to a destination and therefore accommodation can book up quickly. Think about booking early but if there is a large group or you are looking for some alternative accommodation consider booking an apartment, splitting the costs and there can scope for more of you to stay, make more of a holiday and take a look at beach apartments in Barcelona. This entry was posted in Spain and tagged Barcelona on August 28, 2017 by Karen Bryan. Whether you’re heading off for a romantic break, a reunion with friends, a solo adventure or a family trip, Barcelona won’t disappoint. With beautiful architecture, amazing restaurants and relaxing parks around practically every corner, there’s so much to do. Let yourself get too sidetracked by sangria and afternoon siestas, and you’ll end up missing all the city’s wonderful, unique highlights. To help you tick off your entire sightseeing to-do list, we’re sharing five top tips for making the most of Barcelona. Take a look. Barcelona is big and the main sights are pretty widespread, so in the middle of the day when the sun is at its most powerful, you don’t want to be walking too much. There is an underground, but buying a hop-on hop-off bus ticket is by far the best way to get around. The tourist buses will take you to all the major landmarks and tourists hotspots, plus you’ll get a sneak peek at the rest of the stunning city as you go. There aren’t many cities in the world that also boast a beautiful, sandy coastline, so it’s definitely worth taking a break from Barcelona’s historical landmarks to spend a day at Barceloneta beach. It’s only a short Metro ride away, so it’d be rude not to. Whether you work on your tan, get your heart racing with water sports or indulge in some seafood tapas, you’re sure to leave feeling completely and utterly relaxed. Do not underestimate how hot and humid Barcelona gets, especially in the middle of summer. To stay comfy, cool and in good spirits throughout the long days and nights, you need to think practically and pack appropriately. We recommend loose, flowing maxi dresses or lightweight shorts, flat and supportive footwear (definitely no heels, there’s far too many cobbled streets) and some decent sunglasses. You’ll no doubt spend a lot of time getting happily lost in and around Las Ramblas, but it’s important to be careful as you wander about. Although it’s got plenty of fun shops, bars and restaurants, the street is also infamous for pickpockets. Don’t worry about it too much, though. So long you’re aware of the risks, only carry one day’s worth of money at a time and keep an eye on your bag, you should be able to enjoy yourself without encountering any problems. From museums and art galleries to the many Gaudi landmarks dotted around the place, visiting Barcelona’s biggest tourist attractions can soon start to get pricey. To keep your budget and sightseeing plan on track, your best bet is buying tickets online before you jet off on holiday. Whatever you do, make sure you check out La Sagrada Familia. The UNESCO World Heritage site is always packed with tourists but the queues are worth it. Do you have any other top tips for making the most of a city break to Barcelona? This entry was posted in Spain, Travel Tips and tagged Barcelona on May 8, 2017 by Karen Bryan. When travelling it’s not all about buildings and monuments; although a great part of sightseeing, we all know one of the best ways of getting to know a city is through its markets; which mark its culture, gastronomy and style of living. As a Mediterranean city, Barcelona is rich in in all kinds of markets, they be permanent, food orientated or second hand markets. Markets in Barcelona mark the city’s pulse, as well as also being architectural sites. Here’s a selection of Barcelona’s best markets, which will also allow you to visit exciting neighbourhoods of the Catalan capital. One of the best ways to get to know Barcelona as a local and discover its best markets is renting a flat close to (at least one of ) the markets through a agency like oneholidayrentals.com. Then you’ll be able to take your time and enjoy the glorious feast of smells, colors and tastes that these markets offer, and maybe event try some cooking with ingredients purchased there. One of Santa Caterina’s most famous features was part of the market’s refurbiishment in 1997. Its colourful roof, created by Enric Miralles, covers the market and is one of the most photographed rooftops in the city due to its impressive architecture. Inside, classy restaurants sit close to food stalls, combiningthe traditional market setting and innovative cuisine. Just off Les Rambles, the Mercat de Sant Josep, or la Boqueria, is by far Barcelona’s most visited, especially by tourists. Under its modernist roof built by Mas Vila in the mid-19th Century, this market is a feast of colors for the eyes: as many types of fruit as you can imagine, fresh fish direct from the Mediterranean Sea and plenty of spices and herbs. Framed by the market’s porches, you’ll find plenty of bars and restaurants where you’ll be able to taste La Boqueria, such as famous Bar Pinotxo or Bar Central’s typical tapas. Although it is being restored until the end of 2015, this market is well worth a visit. Its majestic metallic structure is another example of the 19th century architecture and is one of the biggest in Barcelona. Surrounding the market you’ll find clothes stalls twice a week, all the food stalls in the adjacent Ronda de Sant Antoni, and a second hand book market on Sundays which makes it an excellent time to visit. Els Encants opens its doors Mondays, Wednesdays, Fridays and Saturdays for both bargain hunters and the curious. This is one of Barcelona’s oldest markets and was famous for its outdoor atmosphere until its location was changed. Now under a modern roof, this semi-outdoor market combines all kinds of secondhand items such as clothes, furniture, books and any other brand new item you can imagine at low prices. On the last floor, you’ll find plenty of ready-made food stalls where you can relax for a while from all the searching t find that bargain. Located in the Sarrià-Sant Gervasi district, this amazing building from the early 20th century is considered an artistic monument. Behind its majestic structure created by big glass windows and red brick walls, you’ll find all the services that the upper-side citizens of Barcelona may need. All the meat, vegetables and fish you can think of, organic stalls, perfume shops and even clothes boutiques. The best time to visit is probably during the Christmas period, as stall-owners make a big effort to decorate the market beautifully and also create a pretty impressive crib. Beautifully hidden in the middle of Barcelona’s Eixample between small side streets, La Concepció is a great market built in the 19th century under the influence of London’s famous Crystal Palace. This is a highly social market, as there are always plenty of activities going on; to create a dynamic space open to the neighborhood, full of flower stalls and with great scents. Around la Concepció, you’ll find great restaurants where you’ll be able to taste authentic Catalan cuisine, made with the market’s products and its best delicatessen. Apart from these permanent markets, Barcelona has many weekly and monthly markets. There’s the Lost & Found Market, celebrated twice a year, where you’ll find the biggest selection of vintage and second hand clothes. The artisan fair in Plaça del Pi, is celebrated on the first Saturday of every month, here you’ll find an excellent array of home-made food Probably the most famous is the Mercat de Santa Llúcia; celebrated during the Christmas period in front of the Cathedral, where you’ll be able to find all your Christmas decorations or the typical Catalan“ Caganer” for your crib. We’ve plenty of other ideas for what to do in Barcelona. This entry was posted in Spain, Travel Tips and tagged Barcelona on October 28, 2014 by Karen Bryan. Travelling as a family, you sometimes feel pulled in a million different directions, especially when you are visiting a city with kids. Everyone wants to do something the other doesn’t and there simply isn’t enough time for everything. The best solution is to find activities that you can all enjoy. Here are seven fun things to do in Barcelona that will keep the whole family happy and entertained, from those with tiny tots to groups travelling with teenagers. 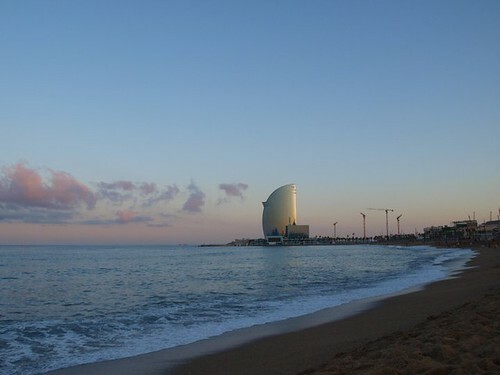 The best way to kick off your trip is by visiting Barceloneta Beach. During the warmer months, the children are sure to enjoy the warm sand and cool water of the Mediterranean Sea while you unwind with the beachside mojito service. You may want to rent a kayak or paddleboard to explore the water further. This is easy to do, and you can find discounts for these services in many of the beachside bars. In winter you can still enjoy a nice walk along the seafront, too. There are plenty of ice-cream kiosks and cafés for a tasty treat and refreshments, tapas bars and restaurants for a traditional meal, and supermarkets where you can pick up the essentials for a picnic on the beach. This epic funfair first opened on top of Tibidabo Mountain over 100 years ago, making it one of the oldest amusement parks in the world. Boasting 25 rides and amazing panoramic views over the city, Tibibado is a great place to spend the day. Getting to the park is also fun, as you can ride up from the FGC Tibidabo station to the lower part of the mountain on a vintage blue tram, the “Tramvia Blau”, which has been carrying people up the hill since 1901. To reach the top you can complete the journey by rack railway, bus, or a leisurely hike through the Natural Park of Collserola. TOP TIP: If you’re heading to Barcelona as a family, I recommend staying in a holiday apartment. It is one of the best ways to enjoy your stay to the fullest as the whole family can be together in the same place, you have your own kitchen so you don’t have to eat out every evening (ideal when travelling with tiny tots), plus most apartments come with Wi-Fi included in the rental price, so if you need to you can stay connected to the world after bedtime. ApartmentBarcelona.com, for example, offers all of the above and has hundreds of apartments all over the city at good prices. A fun and educational way to spend the day with your children is at Barcelona Zoo, which is home to well over 300 species which live in recreations of their natural ecosystem separated by world regions. You can explore the zoo by train or on foot; either way make sure you stop to see the famous dolphin show and the “Children’s Zoo”, where the little ones can pet the animals. Bring your own lunch to enjoy in the lovely picnic area, or try one of the delicious meal options available at the restaurant. Barcelona Aquarium is one of the largest in the world, showcasing over 450 different species. One of the highlights is in an 80m underwater tunnel that gives you the feeling of walking on the ocean floor as you marvel at the sharks swimming overhead. It is divided into three areas: the Aquarium which contains most of the sea life, Planeta Aqua where you can learn about the importance of water in our world, and the Explora area where kids are able to play and explore interactive exhibits. The MIBA Museum of Ideas and Inventions is an interactive and educational experience that will put everyone’s creative mind to work. Enter the museum and travel by tunnel slide to the lower level, where you’ll visit the Corner of the Absurd which presents what the museum curators believe to be the funniest inventions. There is also a Kids’ Space where children can try their hand at inventing. In the museum shop you can purchase inventions you have never seen before to take home as a souvenir of a great day. The Bosc Urbà, or ‘Urban Jungle’ is your adventurous child’s dream playground, with over 50 attractions spread over circuits ranging in difficulty from beginner to professional. Your family’s agility will be put to the test through zip lines, bungee jumping, and high ropes, just to name a few activities. There is no need to worry you’ve never done something like this before, as you’ll receive some basic training on the circuit before the real fun begins! Be sure to come prepared with athletic clothes and shoes. After all that activity, you can book a taxi in Barcelona to return to your accommodation. XMAX is the fastest way to see the Barcelona coastline, as you zoom past all the beautiful beaches on a 50 minute long high-speed boat ride. This is a thrilling experience for kids and adults alike. Rides depart from the Port Vell, and tickets can be bought directly from the adjoining seafront kiosk. This entry was posted in Spain and tagged Barcelona on September 22, 2014 by Karen Bryan. Barcelona is a city with many faces, only a few of which are seen by typical tourists. 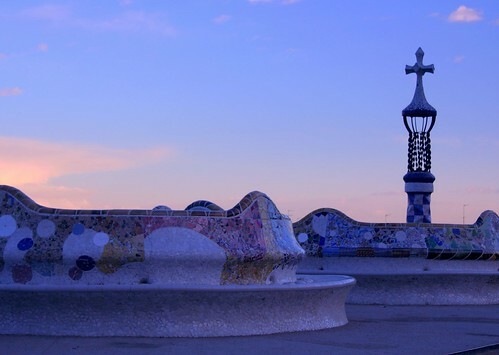 But if you have visited Barcelona before and done Park Guell and Las Ramblas, or if you are just more interested in going off the beaten path, below are some tips. Barcelona is a city of nooks, crannies and exotic finds for even the most experienced travelers. We’ve more suggestions on what to do in Barcelona and If reading our articles whets your appetite for a visit to the city, check out these flights to Barcelona. Barcelona’s waterfront is lined with beaches that are packed like Spanish sardines on a hot summer day. As any beach enthusiast knows, however, not all beaches are created equal. Skip the hoards of tourists in Barceloneta and head northeast to MarBella beach, where you will find a cleaner, less-crowded beach that is open to a variety of personal wardrobe preferences, including nudism. Barcelona certainly has a party-friendly reputation and the fun isn’y only for the groups of teens you can spot in line at the clubs. For a more laid-back scene with eclectic playlists and diverse crowd, head to Marula Cafe in El Barri Gotic. Jam the night away and rub shoulders with the locals here. The Labyrinth of Horta was formerly the estate of Marqua­s Desvalls and where he built an elaborate set of gardens, filled with gazebos, waterfalls, and an impressive labyrinth. Come here for a romantic picnic, a lazy stroll, or an epic game of hide-and-seek. Paseo de Gracia in the Eixample has all of the commonly found international designer brands, but this area spanning the Raval, Born, and Gothic neighborhoods is where you come to get the original clothing pieces that built these classic brands. The stores range in quality and style, from by-the-kilo bargain buys at Flamingos to the curated collection of the Paella Showroom and true designer treasures at Le Swing. Barcelona is full of these little gems, but some testing (and tasting!) proved these to be the crÃ¨me de la crÃ¨me. The Museo del Mamut is a small, charming ode to the furry mammoth during the Ice Age in Barcelona. Learn about the region’s geological history and feel a real mammoth tusk. Have you ever wondered how Europe became transfixed by chocolate? 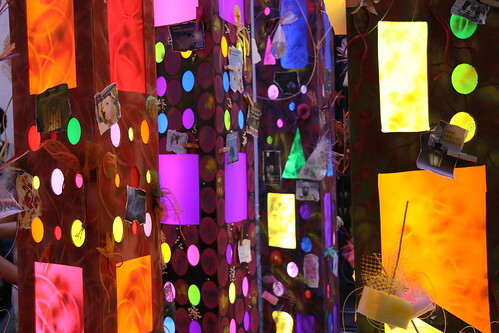 Do you feel compelled to see elaborate confection sculptures? Then stop by the MuseoXocolata, dedicated to the past, present, and future of this famous food, complete with a cafÃ© serving chocolate specialties from around the world. Buff up on your history with English-language tours led by the historians most passionate about Barcelona. See how the Barcelona came to exist as we know it through the Spanish Civil War or learn about the radical roots that run throughout the Raval Neighborhood. These vetted guides will deepen your understanding of Barcelona’s checkered past and help make sense of the modern city. While the line in front of Sagrada Familia is really worth the wait, the Boqueria Marketplace is a feast for all five senses, and that FC Barcelona game tops most people’s lists, you can always try these activities to catch a glimpse of a different Barcelona. This entry was posted in Spain and tagged Barcelona on September 23, 2013 by Julia Burgi. Spain’s “second city” of Barcelona easily rates as one of the best cities to visit in Europe – it’s got historical sights, fantastic culture, delicious food, and you can even spend the day at the beach – what a great combination. If you’re planning your trip then check this list of ten things to do in Barcelona for some useful tips. Let’s travel first with our stomachs: Barcelona’s enormous outdoor markets, , are a great place for either an aimless wander or a shopping trip for any kind of fresh food you can imagine. It’s open every day except Sunday, and starts up around eight in the morning, closing at 8.30pm. It’s easy to find as it there is an entrance on La Rambla, the central pedestrian walk of Barcelona. It seems that here at Europe a la Carte we all like to travel with our stomachs, because no less than three of us have remarked on La Boqueria in the past. 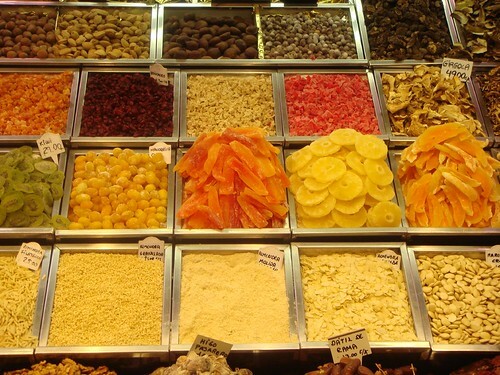 Karen shopped for seafood before cooking up some paella, Lindsay recommends grabbing a freshly-squeezed juice and I was naughty enough to bypass the fruit and vegetable stands for the confectionery! Stomachs full, let’s look at what is probably Barcelona’s most recognisable building: the still unfinished Sagrada Familia. This incredible church was designed by Anton Gaudi and has been under construction since 1882. Being incomplete hasn’t stopped it becoming a tourist attraction (they’ll work around you) and it is not due to be finished for another fifteen years or so. Its eclectic design makes for great photos. Speaking of Gaudi, Park Guell is another Gaudi-designed tourist attraction in Barcelona. You can walk around the park for free and for a fee you can go inside the “La Torre Rosa”, Gaudi’s house. Park Guell is easily one of the most unusual parks you’ll ever take a stroll in. 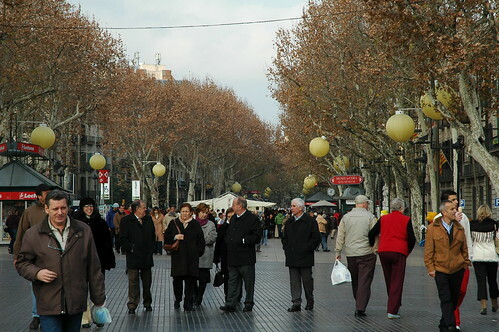 The central pedestrian street of Barcelona, simply taking a walk down here is entertainment in itself. 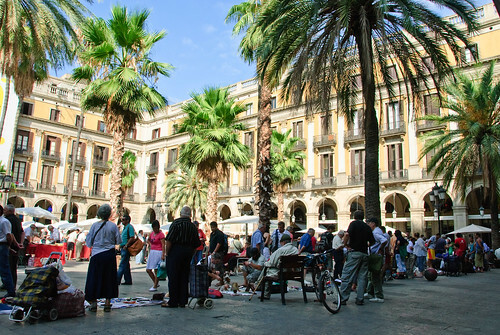 Depending upon the time of day, La Rambla may be fully of buskers, stands and markets, or simply many tourists! It’s a great place to orient yourself to the feeling of Barcelona. 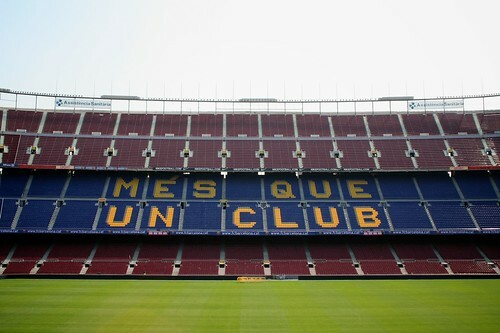 This stadium is home to the very popular football club FC Barcelona so sports fans will love a visit here – there are various tours to take and some behind-the-scenes spots to see. You can also try to get tickets to a home game, which is sometimes not so difficult as the stadium is so large. On a warm day, head to either Barceloneta or Sant Sebastia beach to cool down. In fact there is almost three miles of beach running along Barcelona’s coastline so you should be able to find a beach that suits you. For art lovers, the Musee Picasso is a must see. An extensive collection of Picasso’s work is housed here, much of it donated by Picasso himself, and in particular includes much from his blue period. I’m no afficianado but when I visited Musee Picasso I certainly found it an inspiring way to spend an afternoon. 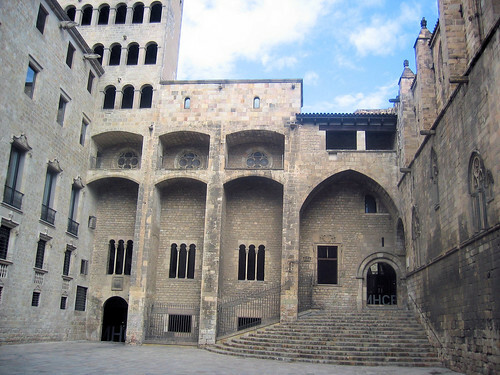 Not everything interesting in Barcelona is above ground: the City History Museum includes the Romain remains, particularly under the Place Del Rei, and you can walk through them and imagine how life was as far back as 10 B.C. I wrote up a post on the City History Museum as I thoroughly enjoyed my visit there – it’s a great place to escape if the heat starts to get to you. Get “on top” of Barcelona on the Montjuic hill and not only will you get captivating views, you will also find quite a list of tourist attractions to explore, including the Olympic stadium (you’ll recognise it if you were a fan of the Barcelona Olympics in 1992), the National Art Museum of Catalonia and the funicula and gondola ride right to the top of the hill. Jeremy has a detailed description of Montjuic if you need more information. Architecture buffs will love exploring Barcelona’s Gothic Quarter. 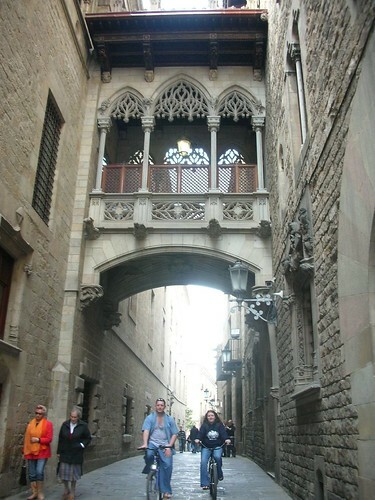 Check Karen’s post listing the highlights of the Gothic Quarter for tips on where to go. If you can time your visit to catch a festival, take a look at Karen’s post on Five Barcelona fiestas. Check out Diana Perez’s guest post on Getting off the beaten track in Barcelona for some lesser-known attractions. It’s possible to find cheap hotels Barcelona if you book in advance and are flexible on exact location. We’ve Europe city guides to the following cities in Spain on Europe a la Carte. 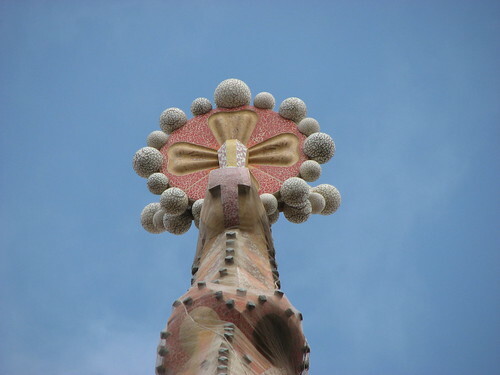 This entry was posted in Spain, Travel Tips and tagged Barcelona on November 2, 2010 by Amanda Kendle. When exploring Barcelona, many people visit the beaches, La Sagrada Familia, and Las Ramblas.Â Barcelona is a unique city in Spain with its own culture in the region of Catalonia.Â When visiting this city, there are a lot of things to see that are unique to Spain itself.Â From its football clubs and the vital part of history they have played to its beaches, Barcelona is a must see city. One area that is worth exploring is the Montjuic area, which overlooks the city.Â Montjuic is translated ‘Hill of the Jews’ in Catalan.Â While the castle on Montjuic is one of the more popular tourist attractions, there is more to this area than just a site for a fortress, prison, and executions. One of the great museums of Spain is the National Art Museum of Catalonia (MNAC – abbreviation for its Catalan name).Â This art museum displays works from this region through various periods and includes Romanesque, Gothic, Renaissance, Baroque, and Modern art sections as well as drawings, photography, and other collections. If this museum doesn’t interest you, the fountains in front of the museum (Font Magica) feature a great fountain and light show set to classical music which runs every night throughout the summer.Â For both young and old, it’s a great time to enjoy music, water, and lights in a relaxed, fun atmosphere. For those who want Barcelona museums with a different flavor, other Montjuic attractions include the Fundation Joan Miro which features the modern art of the Catalan artist.Â As a painter, sculptor, and ceramist, Miro expressed himself through Surrealism and Expressionism and had his own unique style. For the sports fans, there is a museum dedicated to one of the best known events in the Montjuic area – the 1992 Summer Olympics.Â For fans of the Olympics, you can spend hours in this museum reading about the history of the Olympics, seeing the medals from the ’92 games, and checking out memorabilia from athletes like Michael Jordan, Lance Amstrong, and many others.Â You can also check out videos from those Olympic events and see trophies from some of Spain’s best sports teams. If the museum peaks your interest in the Olympics, check out the Estadi Olimpic, the site of the opening and closing ceremonies in the 1992 Barcelona Olympics.Â Walk around the stadium and see the various arenas that served as sights for volleyball, basketball, swimming, diving, and baseball.Â See the telecommunications tower and the site of the Olympic flame.Â With the facilities and improvements made in the Montjuic area, the 1992 Barcelona Olympics was a great success due to the efforts of the late Juan Antonio Samaranch. For a final look at Montjuic, take the Montjuic funicular and gondola ride to the top of the hill to get an aerial view of the city.Â Walk through the park and gardens that surround the area and enjoy a more peaceful side of Barcelona. Since the funicular is part of the Metro, you can catch a ride down to Barceloneta once your visit to Montjuic is complete.Â Then enjoy the great beaches, warm sunshine, beautiful water, and the many other sites that Barcelona has to offer. Read our “10 Things to Do in Barcelona” to help you plan your visit to this great city. This entry was posted in Spain and tagged Barcelona on June 28, 2010 by Jeremy Branham. The city of Barcelona is of course renowned worldwide as one of the best cities to visit in Europe, partly due to its incredible array of sites of great historical interest.Â It’s hard to walk down any street without coming across some amazing building or an incredibly unusual piece of architecture, or a weird and wonderful street-side sculptureÂ One of the most popular tourist areas is known as the Gothic Quarter, this is arguably the area with the highest concentration of historical sites found anywhere in the city. I criss-crossed the Gothic Quarter on aÂ Segway Tour when I was in the city in December 2009. At the Museu d’Historia de la Ciuta there’s an underground set of ruins, which is easily the most complete view of Roman life found anywhere in the world, including Italy. The famous Barcino settlement dates back over 2000 years to the modern city’s foundation. This area has a very large number of public squares including the Placa del Rei, considered by Spaniards to be the most beautiful square in the whole of Spain. 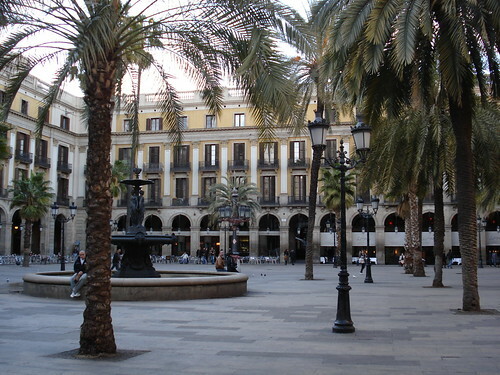 Nearby you will also find the terraced square Placa Reial, another stunning location, ideal for just sitting outside a cafe sipping a drink and watching the world go by. This entry was posted in Spain and tagged Barcelona on June 10, 2010 by Karen Bryan. Barcelona is world renowned as the location of several major colourful and exciting annual fiestas or festivals.Â Â These major tourist events are spread out throughout the year making it very practical to arrange a holiday or short trip to coincide with one of these events that can add enormously to a visitors enjoyment of this already enticing city. Taking place in mid August this is a seven-day fiesta that brings the Barcelona streets to life in particular the neighbourhood known as Gracia where you can party the night away to fireworks, a feast of live music and a considerable amount of local wine. More commonly known in Britain as St. George’ day, this celebration takes place on April 23 and has an atmosphere which is very similar in style to Valentine’s Day. 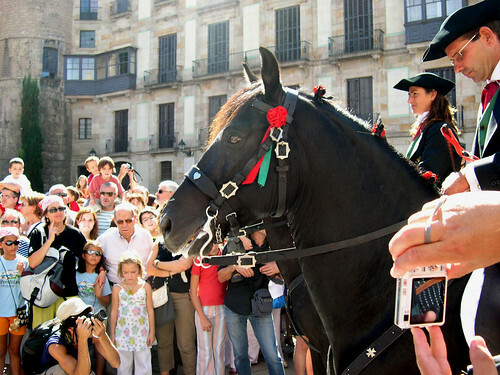 It is a celebration of love, and the city’s streets are filled with endless stalls selling roses and many other flowers.Â There is also a strong literary angle to the festivities with an emphasis on Cervantes and Shakespeare who both died on the very same day.Â The festival also focuses on two literary giants, namely Shakespeare and Cervantes, who both died on the same day. Many book fairs, book readings, street plays and competitions take place on this day, while street performers and musicians put on performances for the public. 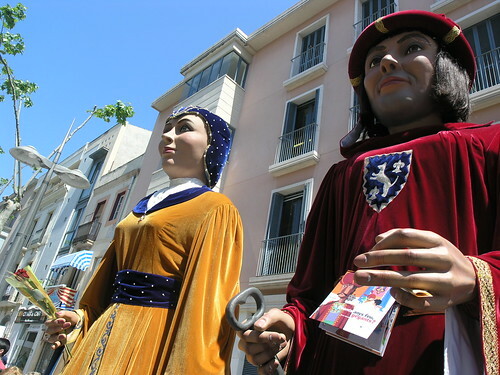 An annual festival that revolves around the patron saint of the city is the Festes de la Merce . The fun begins on September 22 and always is very competitive including a procession of wooden giants and of course the world-famous human tower contest. The occasion also includes a large amount of dancing and live music as well as wine and is always topped off with a massive firework display. 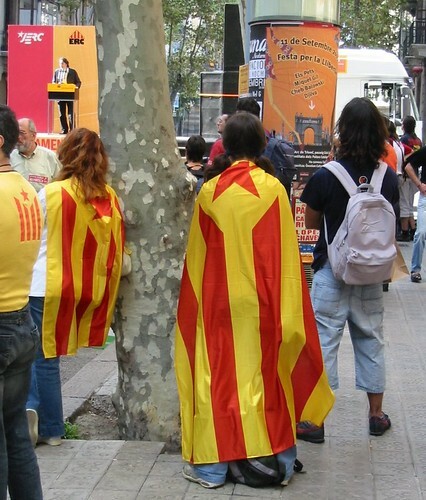 The 11th of September is La Diada otherwise known Catalonia’s National Day. The creation of this holiday was one of the first actions of the reinstated Catalonian Government in 1980,Â commemorating the 1714 Siege of Barcelona during the War of Spanish Succession. This fiesta takes every June 23rd as a celebration of the summer solstice. It features bonfires spread out across the city as well as a huge amount coca de Sant Joan baked by the locals and has always culminates in a massive firework display. This entry was posted in Spain and tagged Barcelona on May 1, 2010 by Karen Bryan. Barcelona is a city full of surprises, and I was certainly amazed to head underground in part of the City History Museum of Barcelona and find such a treasure trove. I stumbled across the “Conjunt Monumental Placa Del Rei” (Monumental Ensemble of the Placa Del Rei) without quite meaning to but I was glad I did. 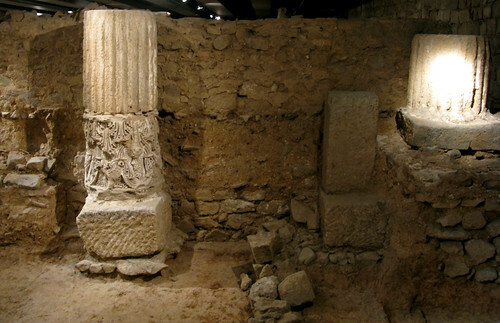 Here you get to go below Barcelona and discover the archaeological basis of the city, in particular beneath the Place Del Rei – covering a large part of the Barcelona of Roman times, and dating back to 10 BC. Of course it’s a bit eerie to be underground like that but you soon get used to it and there is a lot to see – the remains of workshops where clothes were dyed for example, because you can still see the vessels they used for the job; even better, you can see a spot where they used to make wine, with some of the equipment still identifiable. The museum is really well set up so that you can walk through these areas on platforms (take a jumper, it’s a little cool down there!). Their Museu D’Historia de la Ciutat website doesn’t seem to have an English version, but I got English-language brochures explaining the exhibits once I was there. Find out about more museums in Europe on Europe a la Carte. This entry was posted in History, Museums & Galleries in Europe, Spain and tagged Barcelona on April 20, 2010 by Amanda Kendle.